Sutter Medical Center Castro Valley (a Sutter Health affiliate), won the 2009 SNCR (Society for New Communications Research) Award for Excellence and Innovation in External Communications and Communities in the Nonprofit Division, along with our company, Creative Sage™/Cathryn Hrudicka & Associates, and G2 Communications, Inc. We have been doing the first known social media project to inform the hospital’s community about the innovative design and building process for a new hospital to replace the current Eden Hospital (for seismic safety reasons), to listen to their concerns, and answer their questions. and a few other Twitter accts. getting started (can be added later). Sutter Medical Center Castro Valley (@SutterEdenMed) was also profiled in Shel Israel’s book, “Twitterville,” and has been used as an example of an effective social media project by a number of presenters at Health 2.0 conferences, including Ed Bennett, Albert Maruggi, Shel Holtz, and Shel Israel; and by Shelly Gordon of G2 Communications, Inc. and myself (@CreativeSage). At the time, I was the executive editor at the community newspaper group here (timesreview.com). I wrote a column about what I was doing and why in advance of the surgery (http://civiletti.blogspot.com/2009_04_19_archive.html), blogged from the recovery room (http://civiletti.blogspot.com/2009/05/im-in-recovery-area-after-gall-bladder.html), wrote another column, post-op, about the experience (http://civiletti.blogspot.com/2009/05/when-your-comfort-zone-goes-hi-tech.html) and we posted the video on the newspapers’ website, where it got more views than any other video we’d posted to date. I have since become the VP for external affairs at the hospital, where the first order of business is a complete overhaul of its antiquated, clunky website. 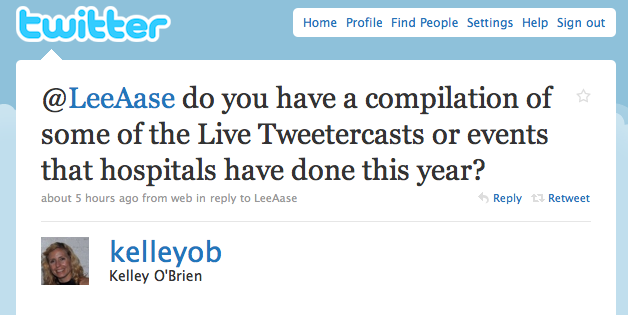 There will be more twittered surgical cases to come! Scripps Health (@ScrippsHealth) in San Diego, CA held a Wellness Day (www.wellnessday.org) in October at six Scripps Health locations. We did a retweet contest on Twitter leading up to the event, and on the day of had both employees and attendees live tweeting the seminars and activities. Oh ye great pioneers of Social Media…I salute you. And matter of fact, we mention many of your organizations when we do presentations on the state of hospitals and social media. Thank you to all of you for showing people what can be accomplished with social media. (Especially you, Lee. You da man.) But I do have a question. How do you deal with issues of privacy while Tweeting surgeries? (I’m guessing a simple release suffices.) But the larger question is…how do you handle it when something goes terribly wrong? A patient starts to bleed out, for instance, or there’s a surgical error… No matter how carefully you plan and how good the surgeon is, these things can’t be predicted. As this practice continues it is only a matter of time before something disastrous happens in the middle of a Tweetcast, and the news of it will blow up as a cautionary tale. Any thoughts on this? Thanks to all who have shared so far. We haven’t tweeted operations at Mayo Clinic, but I’m sure the same HIPAA form we use for interviews would be appropriate for this, too. As for the “China Syndrome” case, I think the main thing is to have a plan in place in advance, such as to say, “We need to halt this chat temporarily, and will be back with an update when we are able.” Something like that. Probably could be worded better. But as I said, we have had cameras in the OR, but haven’t live tweeted yet. At Children’s Medical Center in Dallas, Texas we were the first to tweet real time from a transplant surgery. It started with the father’s surgery, having his kidney removed and continued to the surgery of his 3 year old son receiving his kidney. It was a wonderful story. The key was a lot of pre-planning, ensuring we had the right patient family and being ready for the unexpected. It was an excellent experience. Click the website link to read all about it! We are still getting our feet wet with Twitter here @uvahealthnews, but we recently used it when the Charlottesville area got a most unusual 2 feet of snow over a Friday night/Saturday. The roads were impassable in some areas, and while many employees spent the night and worked extra, we still had hundreds of weekend employees who had to get to work. We used Twitter to put out a call for volunteer drivers with 4-wheel drive and the local TV stations and newspaper, who follow our feed, re-tweeted it. To the best of my knowledge, it only resulted in one volunteer coming forward, but better than none. Also, a Christmas tradition here is for Santa to fly in on our medevac helicopter, Pegasus, and give gifts to patients in the Children’s Hospital. We gave a Pegasus manager cell phone access to our account, and he tweeted Santa’s arrival. I would love to get more into it and tweet new procedures and surgeries. One issue I’ve run into is that Twitter seems to only allow one cell phone number connected to each account, so only one person can post updates from their phone. Does anyone know a way to get around this? Texas health Resources (@texashealth) live tweeted the C-Section birth and Skype interaction of a Texas family. The husband was stationed in Iraq and participated via Skype, meantime the event was live tweeted. It was truly heartwarming – bringing a family together despite the distance & circumstances via social technology. Here’s a link to a news article about the event. This past September we tweeted during an EGD procedure undergone by one of our employees. We used it as an educational opportunity, and to see what kind of response or interaction we might get. Though we did not actively engage with any followers during the procedure, we did attract good local media attention to our social media efforts. 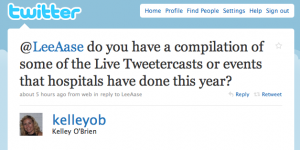 Since then we have shared the “Twittercast” opportunity with several clinical departments, but so far we have not scheduled any other events. Similar to a comment left above, two HCA Virginia hospitals (Reston Hospital Center in Reston, VA http://twitter.com/reston_hospital and CJW Medical Center in Richmond, VA http://twitter.com/cjwmedical ) used Twitter and Facebook in an effort to get volunteers to drive staff members to the hospitals in the face of a huge snow event. Finally, both of these hospital websites have Twitter widgets on the home page, so the website was being updated by the marketing team without having to rely on access to the content management system. Last August our hospital began tweeting ER wait times. We promoted the service primarily on outdoor boards and cable TV advertising. We are the first hospital in the St. Louis market to post our ER wait times. This strategy not only provided people with real-time, relevant information, it created a lot of buzz in the community. Now, if it’s 10pm and a mother is wondering where she can bring her child with an earache, she knows how long to expect to wait. For any true emergencies, the wait time doesn’t apply since they are seen immediately anyway. Check it out at twitter.com/progresswester. The Ohio State University Medical Center uses its twitter account (http://twitter.com/osumc) to share relevant health news (flu, health care reform, discoveries) that are happening around the U.S. and Medical Center specific happenings when appropriate. A few times we’ve been able to use twitter in “crisis” situations like when the power went out to one of our ambulatory care centers. We also have a couple employees who watch for patients tweeting so that we can provide them with the best possible experience while at the hospital. We’ve found that this more personal connection is where twitter shines brightest… people connect emotionally with people much better than they do brands. Vanderbilt-Ingram Cancer Center has used Twitter as one component of a multi-layered project with Playing by Air Productions, a local juggling and entertainment troupe founded by a recently minted PhD from our bioinformatics program, Jacob Weiss. The project combines social media and juggling to share cancer prevention and early detection messaging. You can view the videos at http://www.catchitearly.org (they are also on YouTube). Jacob tweets under the handle @catchitearly and I often RT as @manleyatvicc. I applaud everyone in the medical industry for proactively communicating to the masses interesting news on procedures, news, waiting times, etc. What about examples of leveraging technology to get closer to a 1 to 1 relationship? Is anyone “Onboarding” Patients? Example – I choose to have an elective surgery on my knee which brings about many questions. Sure I’ll ask my doctor, my mother and then I’ll go to the Internet. What about enhancing this “new procedure” to me with pre-surgery communication, with links and other social elements I would find of interest? Besides the links to educational material I would have access to an online “website” tailored to me consisting of a standard set of “tasks” that every knee replacement patient must do prior to surgery. Then follow up with a couple or series of email communications regarding post-procedures that include a link back to my online application for self-reported tasks. You can find me as @jslev. The previous examples really demonstrate how social media is the antithesis of something that can be controlled or manipulated. It’s basically anarchic. Because of that the availability of social media is as valuable inside the walls of the organization as outside. In our organization there are probably 500 or more users who are twittering about a wide variety of organizational issues and maybe 3 are formally endorsed and run by marketing. The rest are all done ad hoc by individual nurses, physicians and other staff. They range from the mundane (planning and executing a nursing ward baby-shower) to semi formal (physician led group participation in community event). The learning is this social media has empowered everyone in the organization and this has democratized and improved the day-to-day interaction between individuals across normal role boundaries. The downside is the horses have left the barn and it’s impossible to manage or exert any semblance of message control anymore. Those that don’t lead by messaging are those that are victims of the message.